While receiving the new roll of ICE Filaments ABS+ it was noticeable that the packaging was airtight and silica was foreseen to absorb possible humidity. To test this new material on my Up! Mini I first printed a caliber piece of 50x50x10mm (Calib3.stl) with the original white ABS material from Up! itself to have a reference to compare the same print in ABS+ with 2 different printer settings. While checking the STL file and the Up! printer settings I presumed that the shell of less than 0,8mm wouldn’t be printed. On the different forums of PP3DP it was already tested and after measuring the STL file geometry I was aware that some walls of 0,5mm would be there after printing. The general settings for all prints: 0.2 layer thickness, ‘fine’ print and a dense ‘scaffold’ (just under 90% infill) internal structure with an outer layer of 1,5 mm. With the basic layer I varied the thickness between 3 and 6 layers to test the difference in warping, all this without support. The first test print with the Up! 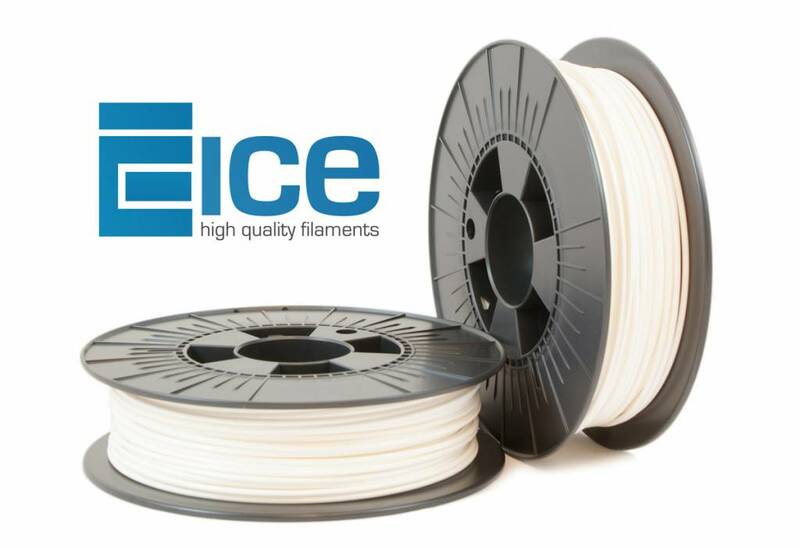 ABS material was the base for the comparison between the ICE Filaments ABS+ and other ABS filaments. After 1h25 the test was ready, with a very noticeable warping on the starting layer. The top layer had a smooth finish, the first layer didn’t. I measured it with a digital caliper, and got the following results: 49,86; 49,93 and 9,55 to 10,15 mm. Not the best print, to be honest. The second test print was with ICE Filaments ABS+. I used the same settings as the first test print, so I could compare them. Replacing the materials gave no problems, neither did the start of the print. While extruding I noticed that ABS+ looked smooth and soft, softer than other materials. The result was a beautiful print where one corner gave a slight warping of 2 to 3 mm² on the first layer. If I wasn’t looking for it, I wouldn’t have noticed it. The removal of the print and the raft were very smooth. The end measures were 49,82mm, 50mm and 9,85 to 10,12mm. The flatness of the top layer was, in all directions, diagonally perfect. The bottom had a slight warping of 0,2 to 0,25, which I measured with a thickness plate. This accords to what I saw visually after the print. Visually this transparent material doesn’t look that well in this form, but the warping and form are better than the first test print results. Remark concerning the thin point: this shell is too thin to be printed without support on the Up! Mini. With the third and final test prints I tried to test the warping by starting with 6 layers instead of 3, which is kind of a real stress test. The same story occurs as with the second test print. On the first layer a slight warping occurs (+/- 0,5mm). By this effect the top layer was slightly curved, but no more than 0,1mm. The external measures of 50,25mm; 49,9mm and 9,36 to 9,92mm thickness correspond to what I measured in the beginning. The Up! Mini has a heated printbed, but on a low temperature of 50°C. If this print was made on a heated printbed of 80°C to 100°C it would give even lower warping, I’m sure. Personally I’m convinced that warping is not only determined by the material, printbed and printer settings, but also by the design of the part itself. Big prints will always have some sort of warping, even with mass production of plastic injection parts a 0,1 to 0,15 warping is not unusual. But, as with everything else, you can resolve any problem with trial and error. ABS+ is a good material to improve the results of warping with prints. I would personally use it for prints that have designs that will warp for sure. The only downside I see is that you need to finish off the print yourself to remove all the loose ‘threads’. This is a result of the melting temperature of the basic material and will be tested easily on other printers with temperatures that you can set yourself under 260°C. On the other hand, this material is perfect for the Up! for structural parts that retain their shape, but don’t have to be perfect esthetically per se.